SAD. my aunt told my mom that only two members in our family can join their trip. so guess who are they? my mom and my sister. damn! i won't get a chance to see my relatives in Fl and i really want to see their school/university. mom said she'll just go with me next year, i really hope that would happen. anyway, i arrived home at 10pm because after school we went to a mall and a grocery store. i'm still looking for my Vegas nameplate, hope i'll find it soon. our maid before stole my two necklaces and my bracelet, hope that's all. but i'm still hoping i can get my necklace back because that's very precious to me. my dad bought me that necklace when i was in 4th or 5th grade. it has a sentimental value! ouch.. anyway, life must go on. i'll probably spend my summer vacation here in Asia, but still hoping to go to US with my dad, or at least Europe. i'll be going to my friend's party this weekend, i hope it would be a right decision, i really want to be happy (with them). it's near 12am already, i gotta log off. school tomorrow. looking forward. just bought this oh so cute laptop last week. it's pre-installed OS is Linux (i think it's customized by Asus) which is very user-friendly. it has 7 tabs (internet, work, play, learn, settings, favorites, and help) on the upper side so it is very easy to navigate. if you want to surf the net, just click the internet tab then web. it comes with a built-in Mozilla Firefox browser, Pidgin (messenger for yahoo, google talk, aim, msn, etc. ), Skype, OpenOffice.Org (similar with MS Office), Dictionary, Webcam, Games, and so much more. 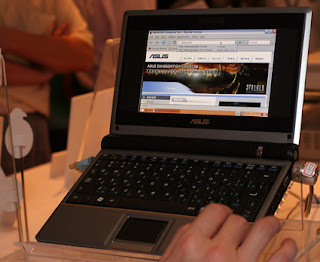 if you want a notebook just for internet surfing, chat with your friends through IM, word, excel, and powerpoint (office) viewer and maker, play games, listen to music, watch movies/shows, and does not costs too much, well this Asus EEE PC is for you. it supports many formats such as DivX, WMV, etc. Screen--good (but not great) quality. Pictures taken from it's integrated 0.3 MP webcam are vivid though it has only low resolution (lower than VGA). It turns on and shuts down quickly unlike other laptops/PCs. you can also run Windows XP in Asus EEE PC but you'll need an external optical drive to install it because it does not have an integrated one. there's always a bad side in everything, Asus EEE PC has only a 4GB SSD, too little capacity. 512MB memory but upgradeable up to 2GB. so you should always have an SD/MMC card, USB flash drive, or an external hard drive for you to enjoy this laptop. good thing it has 3 USB ports, an SD/MMC card reader, an ethernet port, and a built-in WiFi. Asus said that EEE PC's battery can lasts up to 3.5 to 4 hours, but mine only lasted for 2.5 hours. i'm not yet sure maybe i can have my battery replaced. other reviews said their EEE PC works 3 to 3.5 hours. to be honest, i think i'm a loner these past few days. anyway, i'm gonna introduce myself. i'm a Chinese girl, born and raised in the city of Manila, Philippines. I just turned 18 few months ago. I am the youngest and the naughtiest in my family. i'm a freshman student in the field of BA. speaking of my college life, i'm not that friendly anymore. I'm frequently upset because of the people surrounding me. i don't know what i did to deserve having those people around me. My grades are fine. Out of my 8 courses, 6 are "safe". Well, need to study harder. This past few days, it seems so weird because when i'm expecting to pass a test (because i've reviewed), it's the other way around. But i'm not giving up, i need to pass all these courses because i might go to my paradise--US on March. this might sound weird, but one of my inspirations is a place/country. i can still remember the first time i stepped on that place. it felt so surreal..until now. i've been there twice already and might go again this summer. but before that, i have a difficult choice to make. if i go to US, i would need to leave my life, my love, my everything, my d, and that's a very hard choice to make. it's like slicing me into two pieces..kidding. I really don't know what i should do. God please help me to choose the right decision. this is their plan, first two weeks we will be in San Francisco--my muah! then for the next two weeks, we'll be visiting my relatives somewhere in Fl. so that means i will be away from my birth land for a month. will i survive traveling without my love? very tough decision to make. SF is my favorite place in this world, and i want to see my aunt in Fl. i miss SF's famous clam chowder very much. please help me Lord, i really need your support. i'm a techy girl. i love gadgets a lot especially notebooks. well, my addictions change almost all of the time but i'm certainly in love with gadgets. besides that, i'm also a music loverrr. my current playlist includes song by Secondhand Serenade, FM Static, Ne-Yo, Cute Is What We Aim For, Dashboard Confessional, The Click Five, Boys Like Girls, and The Higher. i'm into punk pop/rock music now a days. 4:40pm - finding my Vegas nameplate.. can't see. huhu!! i'm getting lazy writing these on my planner. so i'll just type it here then transfer to my planner one day.